BUYSOUNDTRAX Records presents STAR TREK – MUSIC FROM THE VIDEO GAMES, a compilation featuring music composed by Dennis McCarthy (STAR TREK: THE NEXT GENERATION, STAR TREK: DEEP SPACE NINE, STAR TREK: ENTERPRISE), Kevin Kiner (STAR WARS: THE CLONE WARS), Ron Jones (STAR TREK: THE NEXT GENERATION, DUCK TALES, FAMILY GUY), Kevin Manthei (JUSTICE LEAGUE: THE NEW FRONTIER, ULTIMATE SPIDER-MAN), Danny Pelfrey (FELICITY, JOSEPH: KING OF DREAMS), Rod Abernethy (RAGE, CALL OF JUAREZ: GUNSLINGER), Roland Rizzo, Gregory Smith and Steve Scherer for the many video games that have carried the name STAR TREK. STAR TREK – MUSIC FROM THE VIDEO GAMES features new recordings of music produced and arranged by Dominik Hauser from STAR TREK video games, including selections from STAR TREK: ONLINE, STAR TREK: STARFLEET ACADEMY, STAR TREK: STARFLEET COMMAND, STAR TREK: STARFLEET COMMAND III, STAR TREK: LEGACY, STAR TREK: ARMADA II, STAR TREK: THE NEXT GENERATION – BIRTH OF THE FEDERATION, STAR TREK: VOYAGER – ELITE FORCE, STAR TREK: AWAY TEAM, STAR TREK: KLINGON GUARD, STAR TREK: KLINGON, STAR TREK: BRIDGE COMMANDER and the complete score for STAR TREK: BORG. The phenomenal success of the STAR TREK franchise has had its influence felt far beyond the reaches of television and cinema. Perhaps the greatest intersection between the STAR TREK series and movies and contemporary pop culture has been seen in the video games based on the STAR TREK universe. These games have not only borrowed concepts and characters from STAR TREK but have exteneded storylines and created brand new adventures unique to the interactive world of gaming. The first STAR TREK game was a board game produced by Ideal Toys in 1967. Any good video game arcade in 1982 counted STAR TREK: STRATEGIC OPERATIONS SIMULATOR among its inventory. With a well-known franchise like STAR TREK, composers are usually asked to reference the iconic STAR TREK themes in some manner and some games actually use the real STAR TREK TV and movie themes under license in their soundtracks. Many times, though, it is not possible to license the actual music and video game composers are usually asked to provide music that reflects a similar musical sensibility and this presents a unique opportunity for both veteran composers and budding composers. 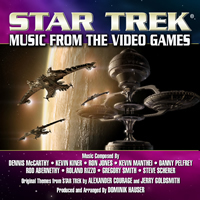 This collection of mostly previously unreleased music selected from the STAR TREK video games has been faithfully arranged and produced by Dominik Hauser with regard to the original performances in the games themselves. BUYSOUNDTRAX Records presents STAR TREK – MUSIC FROM THE VIDEO GAMES, the first compilation ever of music from the STAR TREK video games. The booklet contains liner notes written by author Randall Larson, featuring new insights from the composers. STAR TREK – MUSIC FROM THE VIDEO GAMES is a limited edition release of 1000 units.